Also known as rapid prototyping, 3-D printing is a technology that allows users to create three-dimensional physical products from a digital file. Each product is created one layer at a time, using an inkjet-like process that sprays a bonding agent onto a very thin layer of fixable powder. The bonding agent can be applied very accurately to build an object from the bottom up, layer by layer. The process even accommodates moving parts within the object. Using different powders and bonding agents, color can be applied, and prototype parts can be rendered in plastic, resin, or metal. In fact, this technology is commonly used in manufacturing to build prototypes of almost any object (scaled to fit the printer, of course)—models, plastic and metal parts, or any object that can be described in three dimensions. The first working 3-D printer was created in 1984 by Charles W. Hull of 3-D Systems Corp. Hull published a number of patents on the concept of 3-D printing, many of which are used in today’s additive manufacturing processes. 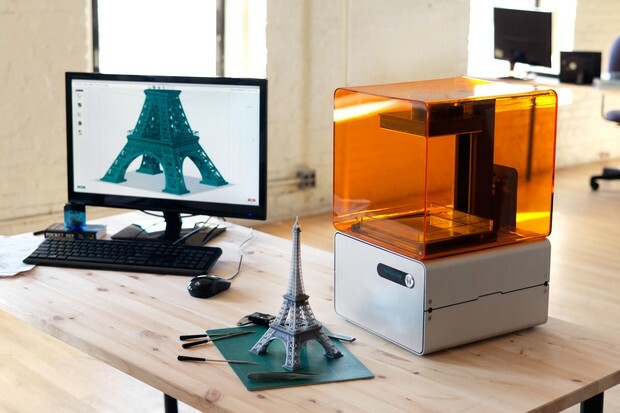 Since becoming mainstream, 3-D printing has worked its way into a number of markets. The technology is now used in architecture, construction, industrial design, automotive design, aerospace, military, engineering, medical technology, fashion, footwear, jewelry, eyewear, and more. Educational institutions are still in the early stages of adopting this groundbreaking new technology, but a few early pioneers have shown us just how feasible–and useful–it can become. One of the areas that 3-D printing has had its biggest impact is in the science field, where the ability to customize and instantly create a tool or new medical device has proven to be quite powerful. From small labs to NASA, researchers are using the technology to advance their knowledge and perform their jobs more easily. University of Wollongong researchers have created some of the first fabricated human skin with a 3-D bio-plotter, the first of its kind in Australia. Research Fellow Dr. Robert Gorkin said that while the bio-plotter worked in much the same way as other 3-D printers, it could potentially be used to create patient-specific implants and one day even organs for transplant. The Wollongong research centre is already using 3-D printing to produce prototypes and custom-ordered items for a range of industry and business partners. Best of all, the 3-D printing movement has opened up research opportunities for students. Last fall, the University of Delaware’s Department of Mechanical Engineering unveiled a new Design Studio that allows students to take design ideas from concept to prototype in one convenient space. The studio consists of four connected work areas designed to foster integrated learning: a prototyping lab, a materials repository, a machine shop, and a collaboration laboratory. The prototyping lab contains computers, tools, and desks for students to use while developing projects, including a new 3-D printer that can produce plastic parts for testing. According to Jenni Buckley, assistant professor of mechanical engineering, the Design Studio is one of the most advanced spaces for undergraduate mechanical engineering in the country, rivaled only by facilities at Stanford University, Pennsylvania State University, and Virginia Tech. Last year the Studio was involved in five different patents on new products, and faculty are outspoken about the level of career experience this kind of exposure is offering students. In many cases, digitally designed objects have the potential to reach greater complexity than handcrafted objects, so how can artists utilize the potential of 3-D printing to realize their vision? This question was explored in an art installation by the scientific-artistic collective Brussels Pulp in collaboration with ADD and the Aalto University’s Department of Art in Finland. The work consists of three 30-cm-high digital sculptures of the EU commissioner for economic and monetary affairs, as well as the euro in three different poses. The work was installed in an old growth forest as a part of the Mustarinda 2013 exhibition in Hyrynsalmi, Finland. The project included a “3-D Printing as an Artistic Medium” art course to master level students, introducing them to the history and use of 3-D printing in art, as well as teaching the basics of polygon modeling and exporting models for 3-D printing. The University of Michigan has an amazing collection of paintings, sculptures, and artifacts that require special attention and care to ensure they survive. Many of these objects are currently in storage with only 10% ever visible to the public at any given time. If a digital duplicate was available, however, one could study a piece virtually anywhere. There would be a snapshot of the object in case further reconstruction needed to be done, and duplicates could be made keeping the originals protected. The UM3D Lab is looking into various technologies that would allow for a quick and easy method for digitally archiving artifacts. Currently its attention is on using a 3-D Laser Scanner and Photogrammetry, which puts the power of modeling and texturing realistic objects in the hands of anyone with a digital camera. As amazingly useful as these developments sound, they are still in their earliest stage. What educators can glean from the movement will evolve rapidly over the next three to five years. Below are a few things to look forward to in the near future. 3-D printing is changing the dynamic of consumer culture, transforming students from passive consumers to active creators. A single RepRap printer costs about $1,200–a real steal in the scheme of your institution’s budgets. And according to a new study from Michigan Technological University, replacing commercially available lab equipment with items generated by 3-D printing technology could cut costs by as much as 97 percent. Parts made with 3-D printers allow for a greater level of customization to individual needs. 4. Manufacturing and Design as Common Knowledge. With widespread adoption, 3-D printers will familiarize students from an early age with the concepts and processes behind manufacturing and design. The availability of 3-D models as open content will encourage experimentation, even for those lacking sophisticated 3-D design skills. The act of generating a 3-D object is highly creative, opening up opportunities for students and teachers alike. Few educational institutions currently own 3-D printers. Investing in one now is a great way to put yours on the map and become a leading figure in educational technology. 8. A Constant Conversation Piece. As 3-D printers can involve all students, they offer instructors a convenient way to capture attention and deliver information en masse without lecturing into thin air. It also provides teachers with a three-dimensional visual aid to illustrate difficult concepts. 3-D printing fits nicely into both the sciences and the arts. And it provides instructors with a perfect opportunity to apply interdisciplinary principles to their lesson plans. As Fab Labs and Makerspaces become more widespread, students will be able to collaborate closely on projects, testing and retesting ideas and working as a team. Researchers and instructors will also be able to share designs with one another in a more efficient and collaborative manner. I am an elementary art teacher and technophile and love using my 3d printers.. I completely agree that they are an important component if schools are to remain relevant. However the learning curve on the software and the ins an outs of printing is daunting. It takes a great deal of time and diligence to be able to learn achieve competency . Most teachers are not going to be able to invest the time needed to get ahead of the learning curve enough to implement them in the classroom. I think manufacturers should look at making software more user friendly. Its very easy to print premade patterns but to use 3d printers to innovate take a great deal of expertise. Stephen, thanks for highlighting a critical point. Like any form of edtech, 3D printers can only reach their full potential if we’ve moved beyond learning how they work to learning how they can work for us.